When I was a young(er) sister, I really enjoyed the stories told by those ahead of me in community about coming home every summer to Saint Mary-of-the-Woods. At the end of the school year (and remember most Sisters of Providence were teachers), the sisters packed all their personal belongings and headed to Indiana. 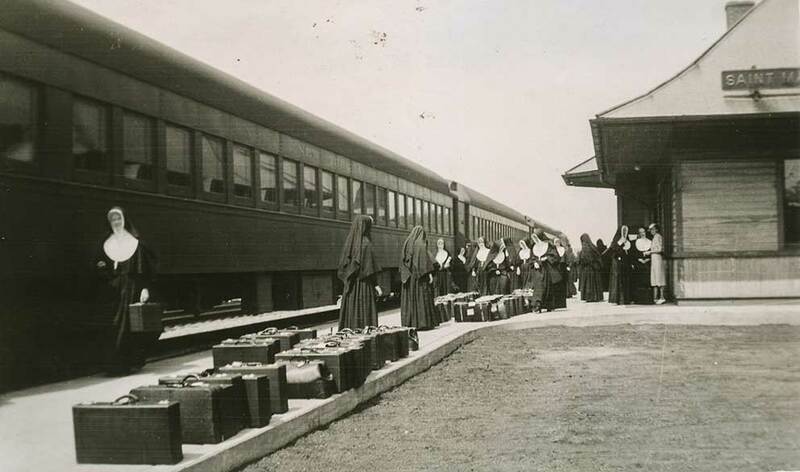 An undated photo showing Sisters of Providence arriving home for the Annual Meeting. My favorite stories were from those who arrived by train and were let off that train across from the main gate of the Woods. More than once I have tried to imagine the scene of hundreds, yes hundreds, of sisters in long flowing black habits carrying their suitcases and making their way on foot up the avenue to find their resting place for the summer. And more than once, some sister has reminded me that the reason we know each other so well is because we came “home” each summer. As June ended and July began this summer, Sisters of Providence and Providence Associates descended upon Saint Mary-of-the-Woods. We call it the Annual Meeting now, and it lasts “only” six days, but it still feels like a homecoming to me, a family reunion of sorts. You can hardly move from one activity to the next without being stopped multiple times to hug those you haven’t seen yet or to catch up with others you know have encountered some challenge or were blessed with a special event during the past year. This year, our time together — sisters and associates — opened on Saturday, June 30, with the celebration of our Jubilarians. No matter the year, before the jubilee liturgy begins, the church is always filled with the noise of people happy to be seeing each other and joyful to be celebrating women who have spent 50 and 25 years in faithful service as instruments of God’s Providence. Our Providence Associates and Candidate Associates actually began “their” annual meeting the morning of the jubilee. With the theme of “Journey as One in Providence” as a backdrop, the associates and candidates began their meeting hearing the stories of the sisters who live and minister in Taiwan. From the newest member, Teresa Kang, who will be received into the novitiate in August, to Sister Donna Marie Fu, born and raised in Mainland China and a Sister of Providence for 65 years, their stories helped all participants get to know the richness of the family of Providence. What a beautiful way to help nurture our oneness. This activity also provided a wonderful prelude for one of the topics explored during the joint session of the associates and sisters during the Annual Meeting—interculturality. Increasing our awareness that we are an international, multicultural community is one of the commitments we made to each other during our 2016 General Chapter. And since the Chapter, the Sisters of Providence were accepted for participation in the “Engaging Our Diversity: Interculturality and Consecrated Life” project with Catholic Theological Union. Many of the fruits of that project were shared at our meeting. In addition to interculturality, we also explored Climate Change as part of our Chapter commitment to our chosen justice focus on the environment. The Climate Change Task Force, an arm of our Justice Coordinating Commission, introduced its Providence Climate Agreement, a pledge to reduce collective emissions of carbon dioxide (CO2) by 2 million pounds by June 2019. It is an ambitious goal, but one we learned can be achieved through a Carbon Diet! Each person was asked to consider his or her own carbon use and pledge a percentage reduction. Keep an eye on our website, www.spsmw.org, for an opportunity to diet with us. After the associates left, we continued our exploration of interculturality and delved into the topic of discernment as part of our ongoing study of the vow of obedience, facilitated by Nancy Sylvester, IHM. We ended the meeting with a succession of reports, bringing the sisters up-to-date on finances, government structures, volunteers and plans for the cemetery. We solicited their feedback. And in between there were prayers uttered, contemplative silences shared, sisters and associates who had died remembered, liturgies celebrated and lots of stories exchanged. There was no procession of suitcase-carrying sisters down the avenue but lots of walks with old (and new) friends down familiar paths. And there was a good old-fashioned ice cream social, complete with sprinkles. 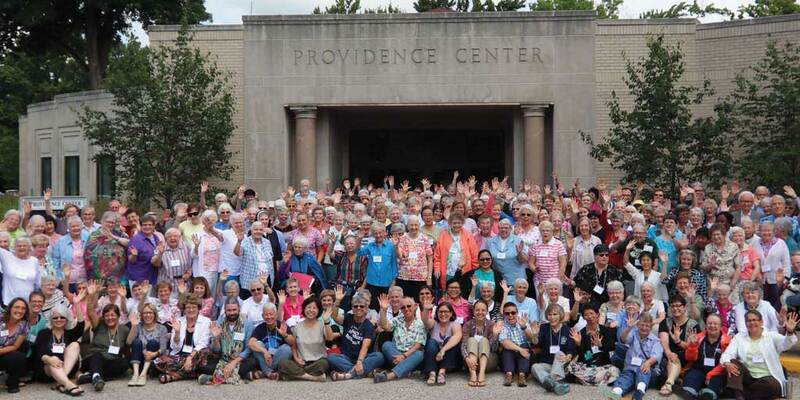 A photo of Sisters of Providence and Providence Associates taken during the 2018 Annual Meeting.